Received: October 24, 2018; Published online: January 31, 2019. Cellular senescence, a process of cell proliferation arrest in response to various stressors, has been considered to be important factor in age-related disease. Identification of senescent cells in tissues is limited and the role of senescent cells is poorly understood. Recently however, several studies showed the characterization of senescent cells in various pathologic conditions and the role of senescent cells in disease progression is becoming important. Senescent cells are growth-arrested cells, however, the senescence associated secretory phenotype (SASP) of senescent cells could modify the tissues’ microenvironment. Here, we discuss the progress and understanding of the role of senescent cells in tissues of pathologic conditions and discuss the development of new therapeutic paradigms, such as senescent cells-targeted therapy. When cells continue to divide by repeated subculture, progressive telomere erosion occurs, the cells are no longer able to divide, and the proliferation is permanently stopped (1, 2). This phenomenon is called cellular senescence and can be observed not only in vitro, but also in vivo (1–4). Since cellular senescence was first described, studies to identify and clarify the roles of senescent cells have been undertaken (5–7). The fact that normal cells can become senescent cells by replication contrasts with the infinite proliferative ability of cancer cells (8). Therefore, normal cells that have been induced into senescence become important in physiological and pathological processes, and the role of senescent cells has become increasingly emphasized (8). Generally, senescent cells are observed as human beings age (1, 2). However, senescent cells are also observed in normal organ development and pathological conditions related to aging. For example, these cells have been observed not only in normal finger digit development, but also in examples of aging pathology, such as cataracts, osteoarthritis and atherosclerosis (9–13). Thus, most of the research on senescent cells has been conducted in primary isolated normal cells, and in vitro studies have induced cellular senescence mainly through DNA stimulation or subculture of fibroblasts (1, 6, 8). Recently, cellular senescence has been observed in tumor tissues (7, 14), however, the role of these cells in lesions is still poorly understood. The role of senescent cells has been studied in recent years. The purpose of senescence is thought to be the elimination of unwanted cells, such as damaged cells (1, 6, 7). In general, transient induction of senescence in damaged tissues is considered to be a process beneficial to tissue regeneration (15, 16). However, the persistence of senescent cells or failure of their elimination, affects tissues by alteration of their microenvironment (14, 17, 18). This is related with cancer and senescence, which is characterized by accumulation of damaged and stimulated cells. Therefore, senescence is believed to be a crucial barrier against cancer progression (19–21). And recent studies reported that senescent cells may be involved in cancer progression (22–24). These senescent cells are thought to originate from tumor cells, and are called senescent tumor cells (25–28). In this review, we focus specifically on the identification and pathological role of senescent cells in the tumors. Identification of senescent cells in vivo has technical limitations. In vitro, morphologic characteristics of cellular senescence are easily observed. Cells appear enlarged, flattened, and granulated, and cell growth rate decreases (1, 5, 6, 29). However, in vivo, senescent cells appear normal and lack such morphological changes (25–28). Therefore, senescence cellular markers have emerged as a tool for in vivo identification of senescent cells (30, 31). Senescence associated β-galactosidase (SA-β-Gal) staining and p16INK4A immunostaining have been considered as effective markers of cellular senescence (25–28). The SA-β-Gal staining method is relatively easy and provides reliable data for in vitro identification, as well (31). SA-β-Gal staining in vivo, however requires fresh frozen tissue preparation, necessitating cooperation between surgeons and pathologists (25–28). In addition, one of the things to note in SA-β-Gal staining in vivo is that it can be stained in normal tissues. Not only the senescent cells, but also some cells in specific areas of normal tissues can be stained by SA-β-Gal (30). For example, senescent fibroblasts in aged skin show SA-β-Gal positivity, but staining is also strongly observed in normal hair follicles (31, 32). SA-β-Gal also stains the mucus in normal colon epithelium (33). Nevertheless, SA-β-Gal staining is widely used to identify senescent cells in vivo, but, because of above strict tissue preparation requirements, the combination of SA-β-Gal with other molecular markers of senescence in the same cells provides more reliable data (30, 31). Other surrogate markers of senescence are the DNA damage signal related proteins or secreted proteins, such as γH2AX, senescence-associated heterochromatin foci (SAHF), p21WAF1, p16INK4A, macroH2A, interleuikin-6 (IL-6), and IL-8 (6–8, 34, 35). However, measuring senescent cells using only these markers may result in erroneous conclusions because p21WAF1 can be fully expressed, not only senescent cells, but also in acutely DNA damaged cells (36, 37). UV exposed skin tissues show marked upregulation of p21WAF1 expression in keratinocytes, without cellular senescence (38). In the case of p16INK4A, a powerful and reliable senescence marker, it is strongly expressed not only when senescence is induced, but also as a result of p16INK4A mutation or HPV suppression (39, 40). Furthermore, IL-6 and IL-8 can also be induced by various immune responses (41, 42). Thus, rather than measuring senescence with a single marker, using a variety of methods, such as staining with both SA-β-Gal and p16INK4A can be a more useful way to identify senescent cells in vivo (25–28). An important feature of senescent cells is that their growth is arrested, but they remain metabolically active (1). Although cell proliferation is inhibited, the cells actively produce many kinds of proteins. Senescent cells are characterized by secretion of many proteins (43, 44). They express IL-6 and IL-8, which are inflammatory cytokines, as well as chemokines that attract inflammatory cells (41, 42, 44). Expression of matrix metalloproteinases (MMPs) that alter the extracellular matrix is high in senescent cells (28, 45, 46). Secretion of these different proteins can affect the surrounding neighboring cells or cause changes to the tissue microenvironment (14, 17, 18). This phenomenon is called senescence associated secretory phenotype (SASP) (18, 43). The expression pattern of the SASP is known to be different, depending on the origin of the cells. The SASP expression pattern is different between epithelial and mesenchymal cells, so SASP’s influence on each tissue’s microenvironment is thought to be different (18, 43). The differential expression of SASP suggests that senescent cells are actively involved in the pathogenesis of various diseases and disease progression. For example, inflammation has been observed to progress in aged tissues, without evidence of pathogenic infection, suggesting that senescent cells are involved in the inflammatory response through SASP expression (18, 47). The expression pattern of SASP is different according to the stimuli of induction, as well. For example, the SASP expression pattern is different between replicative senescence (RS), stress induced senescence (SIS), and oncogene induced senescence (OIS) (6). It has also been reported that the expression of SASP varies widely, depending on the origin of the cells (18, 43). Therefore, when senescent cells are observed in tissues, the pattern of expression of SASP varies depending on the stimuli and origin of senescent cells, and the microenvironmental effects of senescent cells in these tissues may be different (18, 43, 47). Cellular senescence the characteristics of a double edged sword; SASP can have a positive or negative effect on disease progression (18, 43, 47). Positive factors include local wound healing, tissue regeneration from damaged cells, and immune reaction inhibition in damaged cells, processes that aid the healing process (48). SASP can also enhance the expression of MMPs in pathologic conditions, such as hepatic or skin fibrosis, preventing fibrosis during the healing process of liver damage or skin wound injuries (49). The SASP cytokines, IL-6 and IL-8, also reinforce senescence growth arrest in some senescent cells (34, 35). Negative effects include an increased inflammatory response, stimulating the growth of nearby malignant cells, and inducing metastasis of malignant cancer cells (23, 24, 28). It has also been observed that the SASP can cause an epithelial mesenchymal transition (EMT) phenomenon that promotes cancer (46, 50). Therefore, depending on the tissue structure and tissue microenvironment, SASP may be beneficial to the disease progression or may have a negative impact. It is also believed to affect disease progression, depending on the type of SASP expression. Whether the role of SASP in cancer development or cancer progression is positive or negative remains controversial. The history of senescent cell observation in tumor tissues has not been long. It was thought that senescent tumor cells would not be found in malignant tumors because of the decreased ability of senescent cells to divide (7). Recently, however, with the discovery of various markers of cellular senescence and the rapid processing of fresh tumor tissues, large numbers of senescent cells were reported in a tumor mass (25–28). Then, the question arises regarding the origin of senescent cells in tumors. To investigate this, characterization of senescent cells using various senescence, epithelial and mesenchymal cells markers was performed (28). Senescent cells in the tumors tissues were mainly observed with p16INK4A immunostaining and SA-β-Gal staining in p16INK4A non-deleted and non-mutated tumors (28, 39, 40). SA-β-Gal and p16INK4A staining were observed in the tumor mainly, and were considered to be senescent tumor cells. However, vimentin, a fibroblast marker, did not stain the cells, indicating that the tumor cells had undergone senescence (7, 8, 28). Senescent tumor cells have been thought to have the ability to inhibit tumorigenesis, since their proliferative capacity is suppressed (19–21). Senescence is induced by activation of various oncogenes, resulting in the expression of p16INK4A and induction of oncogene-induced senescence, and is observed in normal primary cells, including fibroblasts, melanocytes, and thyrocytes. Therefore, senescence has been considered a mechanism to inhibit cancer development (21, 49, 51). In addition, the disappearance of tumor suppressor genes, such as p16INK4A, p53, and p21Waf1 has been shown to induce cancer development in vitro (7, 19, 20). For these reasons, the presence of senescent tumor cells is thought to have a cancer suppressing effect (19–21). The discovery of senescent cells in vivo after oncogene activation has been reported in mouse experiments. In the K-RasG12V mutant transgenic mouse, a large number of senescent cells with SA-β-Gal staining positivity were observed in the lung adenoma, and no senescent cells were found in carcinoma stage (52). In addition, melanoma formation was not observed when the B-RafV600E oncogene was overexpressed in primary isolated melanocytes, and a B-RafV600E mutation was observed in skin benign tumor nevus, indicating that senescent cells remained in the precancerous region (53). Furthermore, the K-Ras mutant is able to augment growth of breast cells in mouse, but it does not lead to the formation of carcinoma (54). These results present evidence that senescence limits the progression of tumor development. However, recent evidence indicates that cellular senescence or senescent tumor cells can promote carcinogenesis by producing various growth factors, cytokines, and proteases, collectively referred to as senescent-associated secretory phenotypes (23, 24, 28, 43). Although senescent cells are rarely observed in cancers tissues, the existence of senescent tumor cells in cancers has been reported (25–28). Senescent tumor cells are observed in various carcinomas such as thyroid, breast, stomach and colorectal cancer (25, 51, 55, 56). Interestingly, in some carcinomas, the distribution of senescent tumor cells is not even, and it is observed in a specific tumor tissue locations. Senescent tumor cells do not exist in the center of the mass where hypoxic damage usually occurs, but rather in the marginal region of the tumor (28). Furthermore, they are present in large numbers in the metastatic lymph nodes and lymphatic vessels (28). These data demonstrate that senescent tumor cells are actively involved in cancer progression and SASP expression is thought to be involved in that process (28). Senescent tumor cells express SASP and their SASP expression patterns are different than those of senescent cells induced from normal cells, such as fibroblasts (6, 43). The expression pattern of SASP is similar in some proteins, but others differ between senescent tumor cells and senescent fibroblasts. For example, IL-6 and IL-8, common inflammatory cytokines, are increased in both cases, but the expression of chemokines and protease are different (28, 32, 43). The expression of matrix metalloproteinase (MMP) is markedly increased, and a large amount of protein capable of degrading extracellular matrix is secreted in senescent tumor cells (28, 43). It has also been noted that highly-expressed chemokine ligands (CCL) and C-X-C motif ligand (CXCL), can induce inflammation and chemoattract other cells, immune cells and non-senescent tumor cells (28, 57). Among the chemokines, CXCL12 is a chemokine that can lead to non-senescent tumor cells (28, 58). CXCL12 was not expressed in senescent fibroblasts due to hypermethylation of its promoter, however it was largely expressed in senescent tumor cells (28, 32). Furthermore, usually non-senescent tumor cells express a large amount of C-X-C chemokine receptor 4 (CXCR4). Senescent tumor cells secrete CXCL12 that was observed to be related to cancer cell migration and metastasis by interaction with non-senescent tumor cells (28). In addition, senescent tumor cells prevent anoikic cell death in lymphatic vessels, helping tumor cells survive and metastasize to target organs (28). This result suggests that senescent tumor cells are actively involved in cancer progression (28). Thus, senescent tumor cells are thought to play a role in suppressing cancer progression, and also have a role in promoting cancer progression (Fig. 1). Therefore, the study of senescent tumor cells in various organs should be continued. 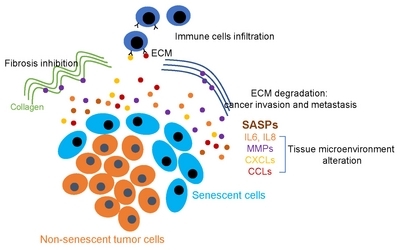 As mentioned above, senescent tumor cells can be observed in primary cancer tissues (25–28), but they are also observed following anti-cancer treatment with chemotherapy or irradiation (18). Induction of senescent cells from cancer cells has been thought to be a reliable therapeutic strategy in tumor therapy (14). Cancer cell death is observed in lethal dose after administration of chemotherapy or radiation, but in cases where sub-lethal doses were given, senescent cells were found (14). Furthermore, the use of retinoic acid for the treatment of acute promyelocytic leukemia, and the resulting induction of senescent cells in the tumor by the cell dependent kinase 4 (CDK4) and CDK6 inhibitor palbociclib, can improve the patient’s prognosis. This is called therapy induced senescence (14). However, as mentioned above, long term treatment seems to have a side effect with SASP expression. Therefore, the combination of senescence-inducing therapy with interventions that clear senescent cells could be beneficial to short- and long-term outcomes in cancer patients (18). Little is known yet about the induction action mechanism of senescent tumor cells. Obviously, morphologically, they are malignant tumor cells that progress beyond the pre-cancerous stage. However, why senescent tumor cells are induced has not yet been elucidated. If reactive oxygen species (ROS) or hypoxic stress induces senescence (59), a large amount of senescent tumor cells should be observed in the central region of the tumor. The possibility of senescence induction by ROS seems low, however because senescence is observed in the peripheral region of tumors (28). Furthermore, we do not think it is a precancerous stage. As mentioned earlier, it is morphologically malignant tumor cells and involve cancer cells migration and metastasis which is characteristic of malignant tumor. Therefore, more studies should be performed in this field. Hayflick L, and Moorhead PS (1961) The serial cultivation of human diploid cell strains. Exp Cell Res 25, 585-621. Herbert B, Pitts AE, and Baker SI (1999) Inhibition of human telomerase in immortal human cells leads to progressive telomere shortening and cell death. Proc Natl Acad Sci U S A 96, 14276-14281. Baird DM, Rowson J, Wynford-Thomas D, and Kipling D (2003) Extensive allelic variation and ultrashort telomeres in senescent human cells. Nat Genet 33, 203-207. Baerlocher GM, Mak J, Roth A, Rice KS, and Lansdorp PM (2003) Telomere shortening in leukocyte subpopulations from baboons. J Leukoc Biol 73, 289-296. Lopez-Otin C, Blasco MA, Partridge L, Serrano M, and Kroemer G (2013) The hallmarks of aging. Cell 153, 1194-1217. Kuilman T, Michaloglou C, Mooi WJ, and Peeper DS (2010) The essence of senescence. Genes Dev 24, 2463-2479. Collado M, Blasco MA, and Serrano M (2007) Cellular senescence in cancer and aging. Cell 130, 223-233. Campisi J, and d’Adda di Fagagna F (2007) Cellular senescence: when bad things happen to good cells. Nat Rev Mol Cell Biol 8, 729-740. Baker DJ, Wijshake T, and Tchkonia T (2011) Clearance of p16Ink4a-positive senescent cells delays ageing-associated disorders. Nature 479, 232-236. Martin JA, and Buckwalter JA (2002) Aging, articular cartilage chondrocyte senescence and osteoarthritis. Biogerontology 3, 257-264. Minamino T, and Komuro I (2007) Vascular cell senescence: contribution to atherosclerosis. Circ Res 100, 15-26. Childs BG, Durik M, Baker DJ, and van Deursen JM (2015) Cellular senescence in aging and age-related disease: from mechanisms to therapy. Nat Med 21, 1424-1435. Bodnar AG, Ouellette M, and Frolkis M (1998) Extension of life-span by introduction of telomerase into normal human cells. Science 279, 349-352. Vicente R, Mausset-Bonnefont AL, Jorgensen C, Louis-Plence P, and Brondello JM (2016) Cellular senescence impact on immune cell fate and function. Aging Cell 15, 400-406. Tchkonia T, Zhu Y, van Deursen J, Campisi J, and Kirkland JL (2013) Cellular senescence and the senescent secretory phenotype: therapeutic opportunities. J Clin Invest 123, 966-972. Serrano M, Lin AW, McCurrach ME, Beach D, and Lowe SW (1997) Oncogenic ras provokes premature cell senescence associated with accumulation of p53 and p16INK4a. Cell 88, 593-602. Michaloglou C, Vredeveld LC, and Soengas MS (2005) BRAFE600-associated senescence-like cell cycle arrest of human naevi. Nature 436, 720-724. Althubiti M, Lezina L, and Carrera S (2014) Characterization of novel markers of senescence and their prognostic potential in cancer. Cell Death Dis 5, e1528. Collado M, Gil J, and Efeyan A (2005) Tumour biology: senescence in premalignant tumours. Nature 436, 642. Krtolica A, Parrinello S, Lockett S, Desprez PY, and Campisi J (2001) Senescent fibroblasts promote epithelial cell growth and tumorigenesis: a link between cancer and aging. Proc Natl Acad Sci U S A 98, 12072-12077. Haugstetter AM, Loddenkemper C, and Lenze D (2010) Cellular senescence predicts treatment outcome in metastasised colorectal cancer. Br J Cancer 103, 505-509. Reimann M, Lee S, and Loddenkemper C (2010) Tumor stroma-derived TGF-beta limits myc-driven lymphomagenesis via Suv39h1-dependent senescence. Cancer Cell 17, 262-272. Vizioli MG, Possik PA, and Tarantino E (2011) Evidence of oncogene-induced senescence in thyroid carcinogenesis. Endocr Relat Cancer 18, 743-757. Kim YH, Choi YW, Lee J, Soh EY, Kim JH, and Park TJ (2017) Senescent tumor cells lead the collective invasion in thyroid cancer. Nat Commun 8, 15208. Denoyelle C, Abou-Rjaily G, and Bezrookove V (2006) Anti-oncogenic role of the endoplasmic reticulum differentially activated by mutations in the MAPK pathway. Nat Cell Biol 8, 1053-1063. Debacq-Chainiaux F, Erusalimsky JD, Campisi J, and Toussaint O (2009) Protocols to detect senescence-associated beta-galactosidase (SA-betagal) activity, a biomarker of senescent cells in culture and in vivo. Nat Protoc 4, 1798-1806. Dimri GP, Lee X, and Basile G (1995) A biomarker that identifies senescent human cells in culture and in aging skin in vivo. Proc Natl Acad Sci U S A 92, 9363-9367. Yoon JE, Kim Y, and Kwon S (2018) Senescent fibroblasts drive ageing pigmentation: A potential therapeutic target for senile lentigo. Theranostics 8, 4620-4632. Bennecke M, Kriegl L, and Bajbouj M (2010) Ink4a/Arf and oncogene-induced senescence prevent tumor progression during alternative colorectal tumorigenesis. Cancer Cell 18, 135-146. Ancrile B, Lim KH, and Counter CM (2007) Oncogenic Ras-induced secretion of IL6 is required for tumorigenesis. Genes Dev 21, 1714-1719. Sparmann A, and Bar-Sagi D (2004) Ras-induced interleukin-8 expression plays a critical role in tumor growth and angiogenesis. Cancer Cell 6, 447-458.
el-Deiry WS, Harper JW, and O’Connor PM (1994) WAF1/CIP1 is induced in p53-mediated G1 arrest and apoptosis. Cancer Res 54, 1169-1174. Di Leonardo A, Linke SP, Clarkin K, and Wahl GM (1994) DNA damage triggers a prolonged p53-dependent G1 arrest and long-term induction of Cip1 in normal human fibroblasts. Genes Dev 8, 2540-2551. Liu M, and Pelling JC (1995) UV-B/A irradiation of mouse keratinocytes results in p53-mediated WAF1/CIP1 expression. Oncogene 10, 1955-1960. Stein GH, Drullinger LF, Soulard A, and Dulic V (1999) Differential roles for cyclin-dependent kinase inhibitors p21 and p16 in the mechanisms of senescence and differentiation in human fibroblasts. Mol Cell Biol 19, 2109-2117. Lee CJ, Suh EJ, and Kang HT (2002) Induction of senescence-like state and suppression of telomerase activity through inhibition of HPV E6/E7 gene expression in cells immortalized by HPV16 DNA. Exp Cell Res 277, 173-182. Gabay C (2006) Interleukin-6 and chronic inflammation. Arthritis Res Ther 8, S3. Kunkel SL, Standiford T, Kasahara K, and Strieter RM (1991) Interleukin-8 (IL-8): the major neutrophil chemotactic factor in the lung. Exp Lung Res 17, 17-23. Freund A, Orjalo AV, Desprez PY, and Campisi J (2010) Inflammatory networks during cellular senescence: causes and consequences. Trends Mol Med 16, 238-246. Liu D, and Hornsby PJ (2007) Senescent human fibroblasts increase the early growth of xenograft tumors via matrix metalloproteinase secretion. Cancer Res 67, 3117-3126. Parrinello S, Coppe JP, Krtolica A, and Campisi J (2005) Stromal-epithelial interactions in aging and cancer: senescent fibroblasts alter epithelial cell differentiation. J Cell Sci 118, 485-496. Biran A, Zada L, and Abou Karam P (2017) Quantitative identification of senescent cells in aging and disease. Aging Cell 16, 661-671. Jun JI, and Lau LF (2010) The matricellular protein CCN1 induces fibroblast senescence and restricts fibrosis in cutaneous wound healing. Nat Cell Biol 12, 676-685. Krizhanovsky V, Yon M, and Dickins RA (2008) Senescence of activated stellate cells limits liver fibrosis. Cell 134, 657-667. Kim YH, Choi YW, and Han JH (2014) TSH signaling overcomes B-RafV600E-induced senescence in papillary thyroid carcinogenesis through regulation of DUSP6. Neoplasia 16, 1107-1120. Cisowski J, Sayin VI, Liu M, Karlsson C, and Bergo MO (2016) Oncogene-induced senescence underlies the mutual exclusive nature of oncogenic KRAS and BRAF. Oncogene 35, 1328-1333. Dankort D, Curley DP, and Cartlidge RA (2009) Braf(V600E) cooperates with Pten loss to induce metastatic melanoma. Nat Genet 41, 544-552. Bos JL (1989) ras oncogenes in human cancer: a review. Cancer Res 49, 4682-4689. Milde-Langosch K, Bamberger AM, Rieck G, Kelp B, and Loning T (2001) Overexpression of the p16 cell cycle inhibitor in breast cancer is associated with a more malignant phenotype. Breast Cancer Res Treat 67, 61-70. Jaszewski R, Ehrinpreis MN, and Majumdar AP (1999) Aging and cancer of the stomach and colon. Front Biosci 4, D322-328. Bleul CC, Farzan M, and Choe H (1996) The lymphocyte chemoattractant SDF-1 is a ligand for LESTR/fusin and blocks HIV-1 entry. Nature 382, 829-833. Ho IA, Yulyana Y, and Sia KC (2014) Matrix metalloproteinase-1-mediated mesenchymal stem cell tumor tropism is dependent on crosstalk with stromal derived growth factor 1/C-X-C chemokine receptor 4 axis. FASEB J 28, 4359-4368. Chen JH, Stoeber K, Kingsbury S, Ozanne SE, Williams GH, and Hales CN (2004) Loss of proliferative capacity and induction of senescence in oxidatively stressed human fibroblasts. J Biol Chem 279, 49439-49446.